The various chapters are based on articles published earlier. Dr. Singh, 1984; Saturn-Venus, 1985-6, the others not specified, but all before 1990. 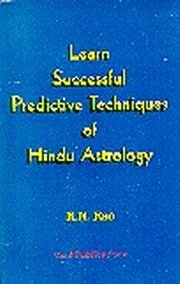 How to verify a horoscope using navamsha, saptamsha, dashamansha & dwadashamsha; Careful points to consider in the interpretation of Saturn-Venus & Venus-Saturn periods; A quick method of timing marriage or relationship, a technique with many other uses; A debate about the correct lagna for Chaitanya Mahaprabhu; The use of 37 separate events to establish the correct lagna for Prabhupad A.C. Bhaktivedanta. According to the author, a Bhrigu reading in 1994 predicted that an early draft of this book would be stolen & not recovered, which came to pass in November, 1995, perhaps in Jackson Heights, New York. From relative obscurity in 1990, K.N. Rao has become one of the leading Jyotish astrologers. He is the retired Director General of the Indian office of the Comptroller and Auditor General, with a life-long interest in astrology, which he learned from his mother. He calls astrology the super-science of the new age. He directs The Astrology School at the Bharatiya Vidya Bhavan, New Delhi. He is a prolific writer. He believes deeply in research that brings solid results. He is unafraid of redefining ancient Vedic scriptures for modern times. He eagerly seeks out obscure techniques, and, once he has tested them to his satisfaction, adds them to his ever-growing repitore. He is challenging & surprising. He is also cranky & apt to tell a fool what he really thinks of him (and in print, to boot), a fault which I think we should forgive.